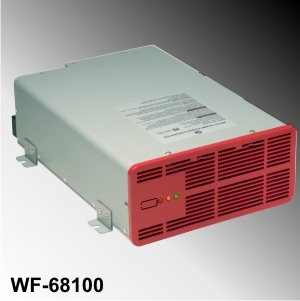 The WF-6800 Series converter/chargers are versatile, advanced power source solutions. Output ratings of 80 and 100 amps are available. Clean, reliable DC power is ideal for powering electronics and appliances. The 6800 Series is designed to provide clean power with or without a battery.Quiet operation is part of the design as the cooling fan runs only when needed. Another advantage is FCC Class B compliance, which means that the converters are designed not to cause interference with televisions, radios or other signals. Battery type selection between AGM/Lead Acid and Gel-Cell type of batteries ensures longer battery life, and smoother converter operation. Electronic current limiting automatically shuts down power during overload or short-circuit conditions. Status LED system on front of converter monitors converter operation as well as provides indication of low battery state of charge.